Hen Shaped Casserole. This Polish Pottery covered dish is ideal for serving home-cooked casseroles, meats, stews - it holds the heat longer because it's stoneware! This covered dish is beautifully decorated and makes a stunning centerpiece. As always with Polish Pottery, this stoneware casserole dish with lid goes from the oven directly to the table keeping your food hot and beautiful! With a lid you can bring favorite foods to a friend's house and they'll arrive ready to eat. Pop it in the oven for a few minutes to reheat. 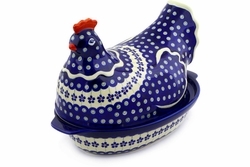 This Polish Pottery Dish can be placed in the dishwasher and microwave, and is also chip-resistant and lead-free. The cleanup couldn't be easier - nothing sticks! For best results avoid sharp temperature swings: cold to hot or vice versa.